Read here about the new, chilling mystery of Rome’s jigsaw skeleton. Police are hunting a 'bone collector' after the discovery in Rome of a skeleton made from five different bodies. 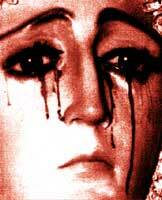 When villagers at Civitavecchia witnessed tears of blood falling down the face of a souvenir Madonna, they proclaimed it a miracle. But soon, experts were branding it a cunning hoax and a row ensued. It's a familiar pattern in Italy, and beyond. What is the truth of such apparitions? Read about the Crying Game.